Everyday dishes made with respect for Southern Italian cultural traditions, absolute quality of ingredients, hospitality and outstanding service – that is the formula of New York’s favorite fine Italian dining destination: The Leopard at des Artistes. This Upper West Side hot spot, owned by husband-and-wife-team Gianfranco Sorrentino and Paula Bolla-Sorrentino, and partner Chef Vito Gnazzo, invites diners to enjoy exceptional food in a warm and inviting atmosphere. The Leopard’s décor, which features famed Howard Chandler Christy murals in the dining room, is inspired by the elegance of the 1963 epic film of the same name. Chef Vito’s culinary signature of authentic Southern Italian comfort food is the draw for visitors and locals alike to the restaurant. The Leopard boasts a diverse menu that finds its roots in the area once known as The Kingdom of Two Sicilies of the mid-1800s, and the culinary traditions of Campania, Basilicata, Calabria, Apulia, Sardinia, and of course, Sicily. The menu also features dishes traditionally found in regions outside of Southern Italy, such as Lazio and Umbria. The restaurant continues to attract a wide array of celebrities, including Steven Spielberg, Howard Stern, Stanley Tucci, Kevin Bacon, Kyra Sedgwick, Hank Azaria, Steve Martin, William Kentridge, Madame Francoise Gilot, John Anthony Baldessari, Giuseppe Penone, James Levin and Valery Gergiev. “Jazz Brunch at des Artistes” is served every Saturday and Sunday, 11:30am-3:00pm, and features Executive Chef Vito Gnazzo’s brunch menu, as well as a selection of “Beyond Brunch” dishes. The southern Italian-accented brunch dishes include Chef Vito’s “Uova all’arrabbiata – Poached organic eggs with spicy tomato sauce and bread croutons, served in a skillet”, “Des Artistes eggs Benedict with Hollandaise sauce served with prosciutto San Daniele and herb roasted potatoes”, and his irresistible “Frittatina with porcini mushrooms and oven-roasted fingerling potatoes”. In addition, the “Beyond Brunch” menu features his beloved “Gnudi – Buffalo ricotta gnocchi, in butter and Parmigiano Reggiano sauce, with sage and organic asparagus”, and the “Ricotta and basil ravioli in butter, sage and Parmigiano Reggiano sauce”. The Leopard at des Artistes is a beloved neighborhood restaurant on a tree-lined block near Central Park that attracts guests from all over the world, and continues to be the place to go for a discerning clientele seeking excellent food and wine. 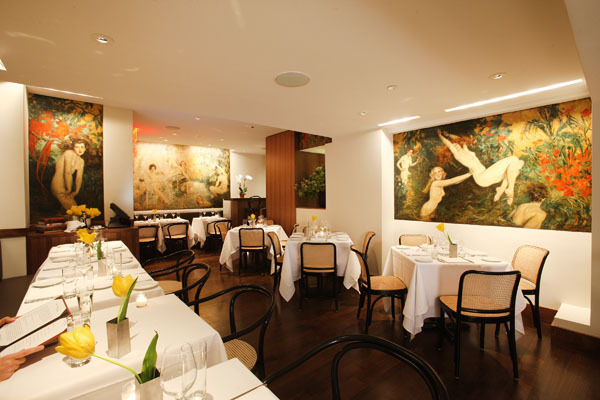 With the fully restored Howard Chandler Christy murals adorning its walls, a great mix of menus and programs the restaurant has a yet unmatched level of sophisticated hospitality and ambience. Rich in history, the landmarked mural series of “Fantasy Scenes with Naked Beauties”, by Howard Chandler Christy, were painted in the end of 1920s, and completed by 1935, when Christy lived in New York City and had his studio at the Hotel des Artistes. There are nine oil-on-canvas murals – some are mounted on wood, while others are directly on the wall. Wood Nymphs (Autumn), Tarzan and His Mate, Ponce De Leon, Bird and foliage (Small insert above Ponce De Leon), The Parrot Girl, Fountain of Youth, The Swing Girls, Birds and foliage (Small insert to the left of The Swing Girls), Wood Nymphs (Spring). The former Hotel Des Artistes was once a favorite haunt of iconic personalities as acclaimed dancer Isadora Duncan, famed playwright Noel Coward, and writer Fannie Hurst. Despite the name, the building was never a hotel, but a co-op apartment building,now considered the largest “studio” building in the city.